For all Idea-fanatics like me.... those on hunger strike, too. >For all Idea-fanatics like me.... those on hunger strike, too. Anybody's got a bright celebration idea? more. Any idea for a cure? Gosh. Another one. based on build 1000 and then the next day spew out build 1001 in EAP. >> For all Idea-fanatics like me.... those on hunger strike, too. Let's make build 1000 the first - and only ? - nightly build. 24-hour night, and spend a full-day super-testing build 999. - we agree to spend the night/day testing it. receive and process our bug reports. Suggestion 5 : write your own one here. is so kind to bestow on us... but live! We could call it... JetBrains Night Live. big Aurora Pre Release party on line? For the official release day. Suggestion 7 : release party in Prague. I thought I was a version fanatic! introduce themselves but also us EAP users. the company will let me. Though I don't know what other developers think, just another idea. Personally, I think IRC would be better suited to large gatherings. 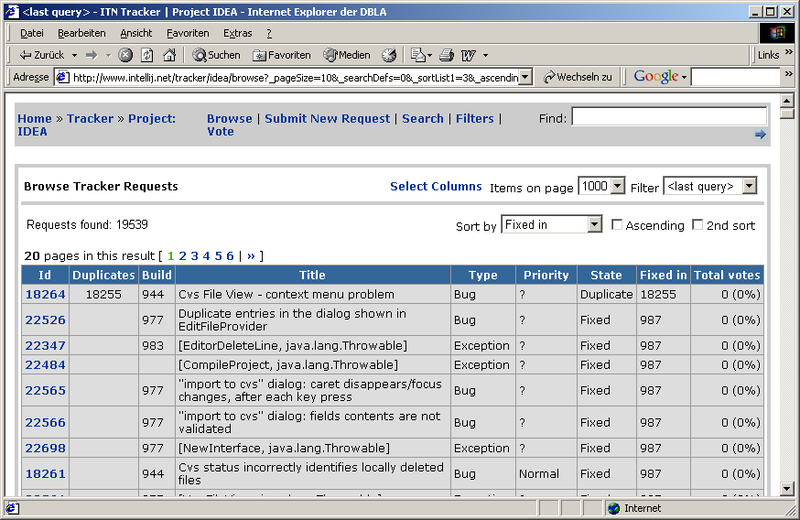 on build 1000 and then the next day spew out build 1001 in EAP. loosing 20kg then ( 18.9kg currently ). w00t. spend the night/day testing it. I'm afraid we're too late for the party - the build number is already well over 10000 (see attached pic).